They brought back so many great memories from my childhood. I had to buy them. My daughter has been patiently waiting for it to be hot enough for us to make popsicles. The time has finally come. We've experimented and tried a few different kinds. 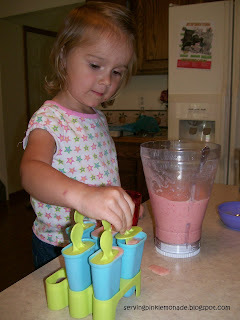 Puree the fruit in a blender. Pour into molds and freeze. We made these without the sugar. I don't think it's needed. Although if you're using plain yogurt you may want to add it. My daughter loved these. I love them because they're really just yogurt and fruit but she thinks they're a really great treat. My nine month old even got to enjoy these healthy pops. Combine in blender. Pour into molds, insert sticks and freeze. Blend until smooth or not-so-smooth, depending on preference. Pour into molds and freeze. Combine all ingredients (can blend smooth if preferred.) Pour into molds making sure the fruit is evenly distributed. Freeze. 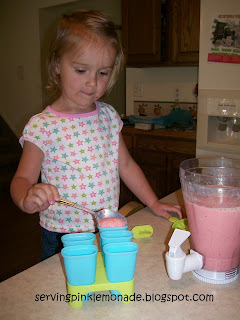 Do you have any favorite popsicle recipes? Mix pudding with milk. Gently mix in cool whip. Fold in Oreos. Pour into molds and freeze. 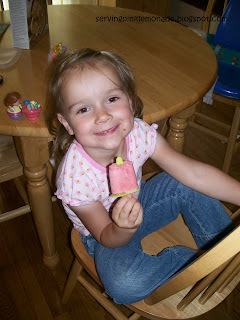 We had homemade pudding pops when I was young and I loved them! I've been looking for molds that are a little stronger than the ones I have seen at the store lately. These look great! Thanks. 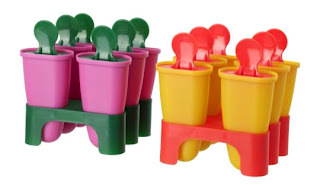 They aren't as fun to make, but you can do the same thing with any yogurt cups, just insert a popsicle stick into the cup with the top still on and put int he freezer. You can get a ton of popscile sticks from any craft store. I want to try your orange cream one though, that sounds yummy! Our Orange Cream Popsicles definitely taste like creamsicles. Yum!